This oclHashcat version 1.37 is about driver compatibility and packaging but also on performance increase and new algorithms. We're very proud especially on the sha512crypt speed increase. You will also notice some multihash performance increase and a much smaller memory footprint because we fixed some memory leaks. 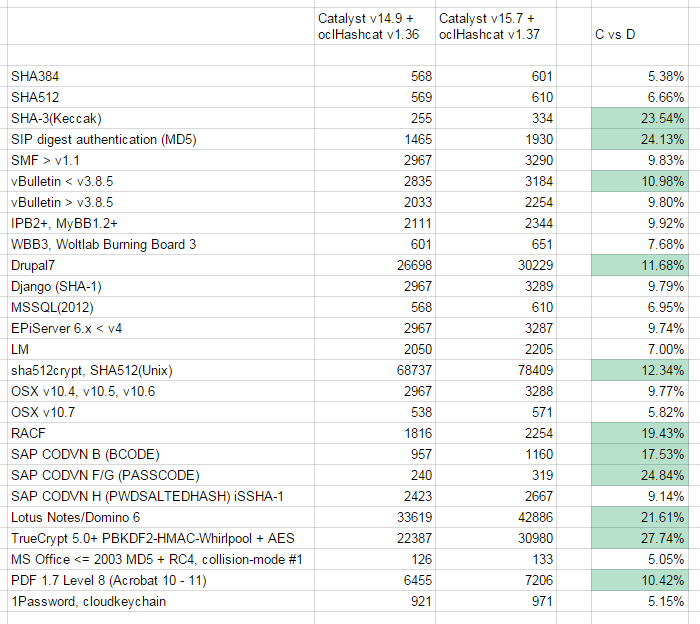 There's a small drop on the performance for MD4/MD5/NTLM. This is a trade-off. The performance drop affects only Brute-Force, but therefore we gain 15% performance increase on rule-based attacks for all those very fast algorithms. We also added some PBKDF2-HMAC-* generic hashes because of the strong request on this. Note that the RAR3 kernel only supports archives with encrypted headers yet. In a later version we will add support for RAR3 without encrypted headers and RAR5, too. WARNING: Linking two modules of different data layouts! which should happen only with amd 14.9 and *only* once for every kernel compile (the first time a specific kernel is being compiled), you can simply ignore those warnings! Beta testers did some tests and the conclusion is that catalyst 14.9 works without problems (even if you see this .kernel "compile warning"). protip: you can run --benchmark (with 14.9) after you download oclHashcat 1.37 once and after that most of the kernels should be compiled (so you won't get any compile warning message after the --benchmark run for those kernels). Nice increases in speed! Good work! Thank you for the new release. Much appreciated. Many thanks for finally getting catalyst 15.7.1 working finally can finish my video on Cracking WPA with oclHashcat using a r9 390X 8GB GPU. Hopefully I can record while its cracking.